The document that President Abraham Lincoln called his greatest accomplishment is on display at the National Archives through Tuesday. Visitors can see the Emancipation Proclamation alongside D.C.'s own Emancipation Act. 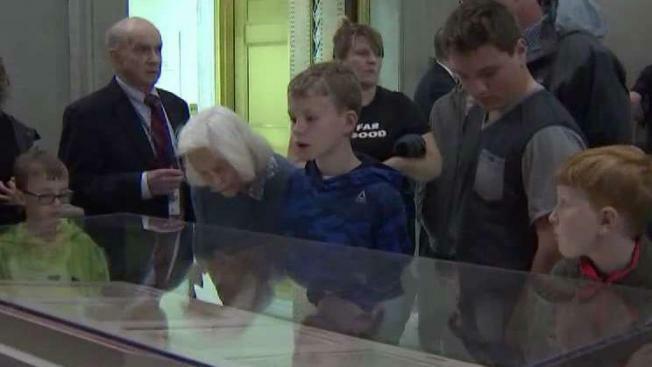 Conservationists take several steps in order to ensure preservation of the Emancipation Proclamation. The document is so fragile, it's kept in a dark vault for most of the year, covered by clear protective sheets and secured by a frame placed in a sealed box. Even when it's on display, visitors to the Archives can only see half the document because the Emancipation Proclamation was written using both sides. John Arnold, a former history teacher form Columbia, South Carolina, says he finds the document inspiring. "These documents and the ideas and thoughts that went into them have always been important to me," Arnold said, "and it's something I try to teach my children to value as much as I do." Though several copies exist of the Emancipation Proclamation, the Archives' version is the only one to feature Lincoln's signature and the seal of the United States, giving it the force of law. Lincoln signed The District of Columbia Compensated Emancipation Act on April 16, 1862, eight and a half months before issuing his Emancipation Proclamation. It freed nearly 3,000 slaves.